Thanks to the National Research Council's Industrial Research Assistance Program (IRAP), Saskatchewan Hemp Association and Saskatchewan Flax Development Commission, I was able to participate in a tour of Eastern fibre processors this winter. The goal of the trip (which took place late January/early February 2001) was to see first hand some of the relevant technologies and meet with some of the institutions that are working with agricultural fibres. Saskatchewan is intent on developing a fibre strategy for its producers and industries -- roughly a dozen westerners made the trip as the eyes and ears of the province. Along the way, representatives from Agriculture Canada and Ontario Hemp Alliance joined our group. The itinerary included Fibrex Quebec in Salaberry-de-Valleyfield QC, the Textile Technology Centre in St. Hyacinth QC, Meridian Auto Parts in Canandaigua NY, Domtar's speciality paper mill in St. Catharines ON and Kenex, in Chatham, ON. HempTown Clothing of Vancouver, BC makes a variety of EcoSexy items including hats, t-shirts, sweatshirts, and custom apparel for your group or biz. Browse through the pictures on our web site and learn how you can get free Hemp for sending in your Ecosexy photo. Non Wood Fibre Meeting: Because of the timing of my trip, I was also able to attend the annual Canadian Pulp and Paper Association's convention in Montreal - held annually at the Palais de Congrés -- and I took in the first meeting of The Pulp and Paper Technical Association's new nonwood fibre pulping committee. Organised by Wade Chute of the Alberta Research Council, the technical group meeting brought together about two dozen attendees, with representation from giants such as Domtar, Millar Western Forest Products. The Technical Association of the Pulp and Paper industry (TAPPI) had a presence as well as smaller and micro specialty manufacturers such as Spexel in Beauharnois QC, Victoria's Ecosource paper, and Montreal's St. Armand mill. While the pulp and paper sector had good representation, and a representative from Cargill USA was present, the lack of direct producer representation was a disappointment. To bring in farmer groups, western meetings are needed; in other words, the pulpers are going to have to go where the action is. "We definitely want to do something in the west to meet with producers," says Chute. "We want to demonstrate that there is enough demand in the west. Both sides are absolutely essential (to advance nonwood pulping.)" There are two streams to production of nonwoods: one is the speciality paper market, exemplified by Domtar's Weeds line and Ecosource. This is the high-end speciality paper market, typified by prices of about $20 a ream. This is a small market, about 50,000 t. a year in North America, and it's not growing. (At the meeting, Domtar took some hits for using chlorine bleached bagasse stick in their Weeds stock, a criticism that has been underpublicised). The other stream is the production of paper pulp from ag resides. By focussing on a lower valued resource and making a technically superior end product, Chute speculates that producers could tap into a broader commodity market. Canadian-made paper made from Canadian grown ag waste and other nonwoods may seem to be an attractive business opportunity, but according to Chute, Canadian industry is not necessarily even focussed on paper production. While millions of tonnes of pulp are produced in Alberta, just for example, there is only one papermaker in the province. Canada exports a lot of pulp. There are many questions and concerns. To begin with, standards need to be developed. According to Bob Hurter of Hurterconsult, an Ottawa based consulting firm, TAPPI/CPPA standards don't work when applied to nonwoods. "You can't follow the test method for wood because of the nature of the fibre," says Hurter "While they have been testing nonwoods all over the world, we have to open some of the doors that have been closed for the past years. For example, smaller mills that produces 20,000 t. a year, selling at $2000 per tonne. They don't want to share the information they have, as it would impact on their businesses." Most of the attendees agreed the more information sharing was necessary. To date, it was felt that there has been a lack of co-ordination of research and the dissemination of the results. While the obstacles of price, lack of technical knowledge and suitable pulping equipment were all recognised as obstacles, but the growth of recycled fibres in paper, over the past 20 years shows that the path is open. They are just getting started, but this committee's formation is encouraging. The group intends to be sharing information with TAPPI's nonwood fibre committee, which has a more international focus. As well attendees agreed the need to relate with other industries that have a commonality of supply such as the fibreboard industry. As I reviewed my notes a few days after the session, more questions emerged. What is a fair price for a bale, and what would the value be if it were roughly decorticated? Who would pay for shipping? What are the economics of erecting large centralised mills versus a network of decentralised minimills? Should farmers invest in local ownership, or would they have a fairer share in just supplying rough fibres to the paper industry. And would minimills compete with each other, driving prices down, forcing some sort of producers' straw pool to maintain prices? And then there are the tradeoffs of local versus global markets to consider. For his part, Chute will be initiating two studies over the next year, a fibre supply study and a nonwood pulp and paper market study. "After this year, I will know a lot more about fibre supply and pulp markets" he says. Fibrex Québec: Fibrex (see the feature in our HCFR June 2000 Issue at http://www.hempreport.com/issues/12/hcfrjune2000part1.html ) is a small flax scutching mill located southwest of Montreal. It's a cluster of two tan and green trim buildings. A half dozen vehicles are parked there the day we visit. According to Thierry Vives, manager, Fibrex contracted about 200 h. of fibre flax with area farmers. They pay between 100-150$ a t. producers, but have come up with some agronomic challenges. Vives warns about using too much nitrogen fertiliser, the flax will grow taller, and correspondingly the fibres grow weaker. "We don't want them to produce for weight", Vives says. The theory is that the less fertiliser used, the stronger the fibre will be. Other issues: when the flax is too long, it gets too long for spinning. As well, when the flax lodges it is difficult to harvest. A good yield would be 5-6 t. an hectare. Where have they grown? Isle d'Orleans and all along the St. Lawrence -- good weather and soil according to Vives. Historically, flax was also planted in the Gaspé (first planted in 1887) and Trois Riviere region (during WW2). Vives speculates that flax should be grown in a maritime climate close to that of Normandy, where some of the best flax is grown. He's curious about how flax would grow in Western Canada, but it doubtful about the weather. In France, he says they seed around the end of March, and flax grows slowly, In Normandy they can get 21% Long Fibre, though generally its around 16%. Other flax producers include Belgium, (LF and tow), Italy (the best LF), Estonia and Latvia too. All of the planting seed come from Europe, at a price of 2$ CDN a kg. The Fibrex plant can scutch up to 70 t a day. But a more average figure is 50-60 t. They are getting a 10% yield of high value long fibre. The best is 14%. The mill also extracts between into bales of 10-15% short fibre/tow. The rest of the straw (70-75%) is shives, dirt and seed. "Garbage" according to Vives. The mill has production limits. They could scutch more than at present, but they figure they currently have a capacity of 500h now. More turning and pressing equipment is needed to expand the landbase. On the floor, a sugary manure like smell greets us. Smell of the field. A half dozen workers buzz around and along the line. This year, Fibrex has enough inventory for one line/one shift through the year. They finish production around June/July and wait two months for harvest and for the crop to ret and be conditioned in the field. A scutching line is an interesting process, a hundred foot length of rollers and mechanical knives which break, crush, drag and separates. Suction draws tow and shive content off the line all along the way. Bales -- about 4-5 feet wide and about 400 kgs in weight -- are brought to the line from the level below by a small crane, which is then picked apart by hand. A second worker straightens and spreads the fibre as it feeds into the scutching line, a series of six closed and vented tubes. At the other end, long fibre comes out. The fibres, gathered and wrapped into soft bundles are sorted by sight into various colours. Six in all: black, blue, grey, blue-blond, yellow and "coloured." Meanwhile snaking tubing carries the tow fibre to the other end of the facility. This is separated again and the tow fibre is packed into square bales, about 572 lbs in weight, suitable for the pulp and paper, carpet, blanket and automotive industry. The tow still has shives in it, Vibes indicates that the mill is hitting 80% cleanliness right now but admits that it could be cleaner. Their equipment has been sourced from Deportee, Union Vlasmachine and Dehondt Technologies. We ask: could hemp fit into the set up? With difficulty. Hemp would have to be half the size to fit, and be shortened at 39". Vives says that with hemp, and capacity of the line plummets to 3-6 bales a day. It's a slow go. Nearby are huge bags of seed. A surprisingly high amount of seed is produced by this fibre crop, which speaks of a long growing season. The seeds are sold in bulk as animal feed, and the big amount of shives -- more waste-- are also sold as bedding to local dairy farmers. Prices: LF 2$ a kilo US, tow sold for $200 US a tonne. According to Vives, the best quality LF (from Normandy) is currently selling at 4-5$ a kg (World flax prices rose dramatically this winter). Check out http://www.fibrexcanada.com for more. Textile Technology Centre: Located in St. Hyacinthe northwest of Montreal, the TTC is really the Canadian Textile Technology centre, as it is the only one in Canada. The TTC has several divisions including fabrication, chemical, and the geotextiles/geosynthetics division. As well, the centre is home base for the Canadian Textile Journal. We took a dizzyingly-paced tour through the centre, and were exposed to a several dozen machines and work stations. The TTC has a huge range of lab equipment suitable for testing, grading and evaluation of all kinds of fibres. As well, the centre is ideal for the development of new fabrics and new properties for fabrics. Geosynthetics are mostly used for erosion control. They can be natural fibres, the advantage being they have a 12-14 month "lifespan" before they biodegrade. The TTC is also well equipped to investigate nonwovens (A nonwoven is generally defined as a textile made of a web like fibre layer fused together by processes of heat, moisture or pressure; a felt is in fact a nonwoven by this definition). Some of the "toys" we saw included a needlepunch -- a punching ridge of 1000 needles -- create a fused mat of polypropylene and other material. 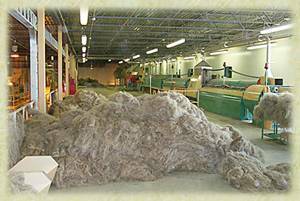 In a few weeks, a peat moss nonwoven comes online; as a natural biological, peat moss makes for an excellent filter. The Centre also regards milkweed as a fibre with good possibilities. Developing new fabrics and testing for Canadian military. The TTC adjoins the CEGEP de Sainte-Hyacinthe, which has a textile studies course, and is blessed with textile equipment including, jacquard loom, ratelier, knitting equipment, as well as a yarn laboratory. Fiber Ethics, 5523 Spring Garden Road, Halifax, Nova Scotia B3J 3T1, Canada. Meridian Autosystems: Located in Canandaigua, NY, Meridian Autosystems has installed and developed a process that uses oilseed flaxstraw in making polypropylene moulded auto parts. The flax is a lighter and more natural substitute for fibreglass. Under the Cambridge Industries banner, the plant has been in the manufacturing business for 34 years, and in the past made items as diverse as bicycle seats, and baseball bats. Meridian Automotive Systems acquired the plant in July 2000. Today, Meridian has about 30 plants globally. This writer signed a nondisclosure agreement so I could tour the plant, limiting what I can write about the technology in place. However, former owners Cambridge have a plant with a similar technology in place in Brazil. "The parts produced in FLAX PP can receive finishing in the apparent surface, where we can use as material of corbetura the vinyl and/or fabric and/or TPO (Thermoplastic Poly Olefin). The application of the covering material is carried through at the moment of the conformation of the blanket of FLAX PP in one determined mold that confers to the two materials the required pattern." (See http://www.cambrinc.com.br for details). Meridian has the capability to make moulded panels, trim panels and soft touch panels, via injection moulding and pressure moulding. The rear shelf panel for the 2000 Chevrolet Impala comes from this plant. Labour is organized via a "cell" approach: teams of workers work in small groups, all of them responsible for every part of a step of the process. With this approach, Meridian claim they have achieved a high level of quality, with a low 100 parts per million defective parts ratio. Some of the straw is supplied by Saskatchewan's Durafibre, who pay between $5-10$ a tonne to area farmers. 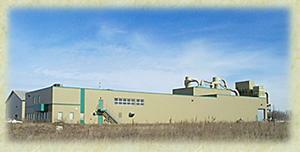 The fibre is then shipped to Durafibre's Canora plant where the fibre is refined. Other markets for Durafibre include cellulose as a replacement for wood flour in construction products and US currency maker Crane (See http://www.producer.com/articles/19991104/production/19991104prod03.html and http://www.crane.com ). Some of Meridian's flax is imported from Europe, which is darker in colour than the blonde Saskatchewan straw. Colour doesn't matter for this application. The European tow is also cleaner, with lower shive content. The plastic in the mix is purchased from a brokerage. Meridian does not make it. Meridian had $32 million in sales last year, and was projecting growing to $75 million in sales over 5 years. 85% of the business currently goes to General Motors. Domtar: Quebec-based pulp and paper giant Domtar has one of their smaller paper mills in St. Catharines. The mill was built in the late 1800's, originally as a cotton/textile mill. It was converted around 1910 to make paper. Today, the mill employs about 160 workers and about 30-40 managerial types. The plant has an output of 150 t. a day. This is tiny, compared to their Windsor, Québec facility that produces 1500 plus t. a day. (Domtar also used to own the Beauharnois mill, which makes Canadian money out of cotton and jute fibres. This was sold off in 1995 and became Spexel; go see http://www.spexel.com ). According to Peter Gilbert, product manager, "We used to make commodity products, until NAFTA, then we had to switch to speciality papers so we could compete in the North American market. One way we survived: we don't make our own pulp; we use recycled fibres." The plant uses 20 different fibres in total, with recycled defined as both preconsumer and post consumer waste. Because the mill doesn't make pulp, there is no smell. This is welcome, as the Niagara region is full of toxic blemishes. Think Love Canal. Domtar released their hemp-content/bagasse "Weeds/forest free" paper earlier this year (see HCFR May 2000 issue http://www.hempreport.com/issues/11/may2000pt3-4.html ) and want to sell more of it, but Gilbert realizes it is too expensive for many consumers. The hemp pulp used in the first run of papermaking was imported from Spain. Local growers and processors Kenex are aiming to supply this contract. A sheet of their pulp, looking like thick and sturdy white egg carton grade cardboard was on display at the recent Canadian organics show in Guelph. According to Domtar and Gordon Scheifele, the pulp was manufactured somewhere in the US. "The paper industry is capital intensive, you just can't throw hemp/straw into it," warns Gilbert in a pre tour briefing. "You have to build a process." The mill itself is a warren; steep steps lead downstairs to where the papermaking: a grotto of puzzling machines. The old brick walls are covered with moss-looking paint, and the atmosphere has almost a vinegary smell. Cigarette pails dot the far walls; workers can still smoke here. The papermaking begins with the suspension of fibres in water, and is mixed with cornstarch and soda ash. Then at a speed of 25 km/hr, 600' a minute, the liquid paper rolls down the line. A series of steps removes the water from the paper, with increasing difficulty as water content decreases. Water draining starts with gravity, then is "couched" out by a series of heavy granite or plastic rollers that keep the paper smooth. Steam dryers, reaching 250 degree F. are also used in the process. This step is comparable to steam ironing. Further down the line, the paper is "flipped" so that the off side is also pressed. The paper is made in a nonstop continuous run. When paper colour is changed, then the mixed colour paper is scrapped. Mixed, intermediate coloured stock is fed back into the system as needed, or thrown into black coloured paper lots. Domtar has lots of on and off site storage for this preconsumer waste paper. They have barrels of it. Equipment is old, but functional, starting with what seems to be a huge Hollander beater. "The good thing about this old system is that its visible, " says the engineer conducting our tour. "You can see the product at all steps along the way. At the Windsor mill, it's all done in a big box." While much of the equipment is old, banks of computers display essential characteristics of the paper and the process, allowing for fine-tuning of the specs as needed, and consistency to carry over from worker to worker, shift to shift. Computers also allow colouring to be tracked -- colour can be automatically set and adjusted. Upstairs is the sheeting department, where the huge 1000 plus lbs. of paper rolls are cut and packaged. Half of the paper is sold in rolls, the other half in sheets. "It's a bit of a bottleneck," Domtar admits. 99% of the sheets are hand cut by a guillotine, a strong straight edge. From the sheeting department the paper is shipped to markets around North America. This leads to service challenges, as paper responds to local humidity, therefore a paper milled and cut in St. Catharines will respond differently at printshops in Texas or Colorado. What is the output? "If we ran all the time, we would run about 180 days a year. We don't run all the time because of market conditions," says the engineer. Kenex: the last stop. Much has been written about Kenex to date, and they are sometimes reticent about sharing information. Can't blame them, they are into hemp as a business, and not because of a desire to be leaders of some industrial cannabis movement. It's a cold southern Ontario day. This part of southern Ontario rivals Belgium or Saskatchewan for the level plain. If the trees weren't about, the plain feels like it would go on forever. The main Kenex facility consists of two buildings and 4 large grain bins. The sign reads "Kenex: producer, processor, distributor." About 8 cars are parked in the lot. According to Jean Marie Laprise, President, there are some 10 shareholders in the company, most are area farmers, and some are out-of-towners. The history is well known, they started R&D in 1995 and 5 years later have a centre ice seat on this developing industry. Laprise admits that hemp is an "extra-challenging" environment. "Markets are developing," says Laprise, "and we are certainly interested in continuing with this project." Laprise points to a third smaller building, set at some distance from the others: that's the home of the sister Industrial Hemp Seed Development company, the top breeding program run by Peter Dragla. After several years of work, three new varieties have been developed and are on the 2001 approved cultivar list (see story in our last issue at http://www.hempreport.com/issues/15/TopoftheCrop15.html ). Two of the varieties are geared towards fibre production in the more southern latitudes; if and when hemp is reintroduced in the US, Kenex is well positioned. Back to the buildings: one houses the processing operations. We do not get inside, but are told it holds the dehuller, two oil presses, and fibre separation operation. A vent sends the core material to the second building, where its packaged into plastic bags for the bedding market. The second building is mostly storage for bagged bedding and for bales of tow fibre, ready to be shipped. "Animal bedding is going well. We are selling everything we are producing." These markets are in Canada and the US. The biggest problem is competing with wood shavings, which are still cheaper in price than hemp hurds. How about hempseed processing? " Our capacity far exceeds the market right now," says Laprise. Kenex, like others, are also dealing with inventory issues, as the great grain surplus from 1999 is still hanging about. "There is lots of grain out west and it would be foolish for us to grow some; probably we could buy some cheaper than we could produce." Laprise indicates that any Kenex production this year would likely be for certified seed, or for fibre. On this early February day, they are not sure of the amount. "From a fibre (processing) perspective our fibre is going into automotive and paper applications," says Laprise. "We process our fibre like a tow line; we have no intentions of feeding into Long Fibre markets from the start." For their line, Kenex built some equipment and imported some used pieces from Europe, which has since been heavily modified. Their separated fibres are sent to Indiana for fibre matting, which is then sent to a plant in Ohio to be formed into shelves which are then sent than back to Canada for final assembly. Art Caron heads Kenex's automotive program. He hefts a hemp/polypropylene shelf, similar in composition to shelves we saw at Meridian. "There's a number of auto manufacturers working with natural fibres," says Caron." You can pretty much mould it into anything." The company has also processed kenaf and are doing small amounts on a semi-regular basis. Says Laprise, "We were the only ones who can process the kenaf into a form suitable for the auto industry. This proves our equipment works. After hemp, kenaf is a piece of cake"
Not all the technology has worked out. A complete matting line sits disassembled in the warehouse. This is for sale. A bargain, says Laprise. This was an expensive adventure; today the company is simplifying and sticking with the first level of fibre separation. Laprise also indicates that it's unlikely that the company will be growing again for "dual use". Laprise says that, oilseed production doesn't care for the fibre, and fibre production doesn't need the oilseed. He says they average about 3 tons an acre for fibre. He thinks 5 tons an acre is realistic, but hasn't done it. Kenex gets about 30-35% fibre yield from their tonnage. The company pays 180$ a ton for straw. They look after the harvesting, retting and baling. Ideally, fibre is harvested at 9% moisture. Laprise says retting was quite a challenge. " It can take two months to ret properly," he says. "When we started we did it the wrong way - we retted, we got a beautiful golden fibre, but it was 11'-12' long. Beautiful - and not really retted." Having been involved in hemp since the mid 90's Kenex has experienced several, unexpected challenges. The sense I capture though is that the fibre business is starting to manifest on a legitimate basis. Anyhow, back on the bus, a bitter wind is bringing in a storm. There is no quick way of measuring fibre/hurd content in the field. The company random samples, hand weighing, and hand samples. The company has experienced up to 995 lbs. of volunteer hemp on peas. Achieved some good GLA levels with Anka: "We've had better results than in some varieties, contrary to common wisdom of 'north is better" for EFA levels." Gordon Scheifele of the University of Guelph has been researching the potential of hemp crops in Thunder Bay and Northern Ontario for the past few years. In September he presented two papers at the BioResource Hanf. Both papers concerned the growth of hemp in Northern Ontario. Scheifele met with other Canadians at the conference -- from Quebec, New Brunswick and British Columbia. He met hemp breeders from Finland, Hungary, the Ukraine, Russia and the USA. Co-operative research and production of seed is anticipated with Finland and the Ukraine. Hungary, home of Dr. Ivan Bosca (the" Grandfather of Hemp") was reluctant to participate in a partnership with Canada until our acreage is larger and more stable. "I benefited considerably from the assistance of Mr. Peter Dragla, hemp breeder with IHSDC/Kenex Ltd., for helping in developing contacts and interpretation from Russian, Hungarian and Romanian into English," says Scheifele. Dragla and Scheifele were able to visit two different fibre-processing plants in Germany. The VERNARO plant GmbH plant in Gardelegen (owned and operated by Fred Bohndik) and The AKE-INNOTEK plant near Dresden. Feeding hemp stalks from round bale into AKE-INNOTECH fibre processor. Picture courtesy of Gordon Scheifele. The VENARO plant has contracted 850 h. of hemp with local farmers. It produces 100 tonnes of fibre every month for Mercedes Benz. The cores are sold as animal bedding. The AKE-INNOTEK facility is focussed on fibre processing technology. Both expressed a strong interest in developing Canadian partnerships for their technologies. Plans were to visit Hungary, where the largest hemp processing facility on Central Europe was located, but because of the previously mentioned "lack of expressed interest" from Hungary, the trip was diverted to Romania. In Romania, Scheifele was leased to visit the breeding station of Dr. Constantine Gauca in northeast Romania. Dr. Gauca, who has been breeding hemp for 30 years, has been in partnership with Dragla and IHSDC/Kenex of Chatham. Dr. Gauca, Dr. Bosca (Hungary) and the Ukrainian and Russian hemp breeders all complimented Dragla on his accomplishments of a few short years in Canada. Scheifele noted some great varieties of hemp that could be adapted for use in Canada to produce consistently large grain and excellent fibre. The group met also met with the president of the Academy of Agricultural Science in Bucharest to discuss the possibility of using Romanian facilities to analyse hemp meal and oil. Scheifele also made contact with a Romanian company that produces denim type fabrics for trousers and jackets. 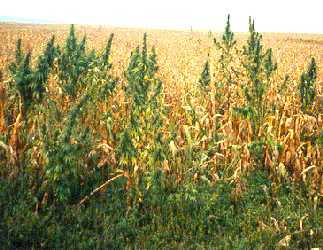 Romania: Hemp planted into corn field -- used at harvest time to tie corn sheaves. Picture courtesy of Gordon Scheifele. The trip also afforded Scheifele the opportunity to appreciate the cultural depth of Romania. He visited their parliament building, which is the largest in Europe and even larger than the Pentagon. "It was a lifetime experience, " says Scheifele who thanks the University of Guelph, the Hemp Industries Association, Ontario Hemp Alliance and Greg Herriot of Hempola for their support. A version of the article originally appeared in Green Mantle, an environmental newspaper published in NW Ontario. Reprinted by permission. In 1999 four hemp-fibre factories operated in Romania. All use biological water-retting technology. The type of seed used mostly in Romania is "Lovrin 110" which is certified within the European Union. The textile production of long fibre, which includes spinning, weaving, and confection takes place almost exclusively in Romanian Moldova. The leaders, in producing large quantities and finest quality, are the German companies. The continual treatment of the short fibres to rope happens mostly in Szeged, Hungary. (Company ELSÖ). Hemp cords are sent from there all around the world, in particular the USA. However, the American-owned company "Hemp Supply Romania SRL" (located in Romanian Moldova) appears also quite successful. Altogether it must be stated that the future of the Romanian hemp industry is not yet secured because of strongly varying demand and the chronic under capitalization of the hemp fibre factories. The fact is that the capital is fixed up to 4 years within the production process before money results can be seen. The production process includes, first two years in seed production (prebase and base), the third year in fibre production on the field, and the fourth year in fibre separation in the factory. If the Western European automobile industry should decide to use hemp as a product for reinforcement, then Romania will become the top provider. More than 100 individuals with an interest in commercializing new agricultural fibres, utilizing cereal straws and cellulosic biomass gathered for the 3rd consecutive year in Memphis. Attendees to the 3rd Annual AgFiber Technology Showcase were from throughout North America including Alberta, British Columbia, Manitoba, Ontario, Saskatchewan, and from as far away as the United Kingdom and Italy. The Third Annual AgFiber Technology Showcase was held Oct. 4-6 at the Cook Convention center and Agricenter International in Memphis, Tennessee. Other speakers for the nonwood pulp and paper symposium included: Frank Riccio, Danforth International, 2000 Chairman TAPPI NonWood Committee; Erix Xu, Andritz Inc.; Tom Rymsza, Vision Paper, Albuquerque, NM; Med Byrd, NC State University, Raleigh, NC; Michael Brown, Buckeye Technologies, Memphis, TN; and Roberta Jacobs, University of Wisconsin, Stevens Point, WI. Wednesday's activities closed with a final session entitled "Perspectives on Ag Fiber Technology" in which AgroTech President Peter Nelson expressed the need to develop strategies toward these emerging technologies that include multiple bodies of influence from a wide range of fibre and agricultural backgrounds. He also emphasized communication and shared vision between the various entities involved with commercializing agri-fibres. Two speakers that captured the essence of a broad concept of the scope of emerging technologies were Bill Miller of Miller Consulting Group of Jackson, Miss., and Geof Kime of Hempline Inc. of Ontario, Canada. Exhibitors at the showcase included: AgroPlastics Inc.; AgroTech Communications, Inc.; American Kenaf Society; Durafibre Inc. of Cargill Limited; Hempline Inc.; Mississippi State University; Stover Equipment Company; and School of Polymers and High Performance Materials, University of Southern Mississippi. Thursday offered attendees concurrent sessions for most of the day, which featured different elements of the agricultural fibre industry ranging from bast fibers to cellulose derived fuels from biomass. The first session for the day gave attendees the opportunity to learn about flax projects in Georgia and South Carolina from Dr. Roy Dodd of Clemson University who's research goal is to develop a flax fibre production system as part of the development of a flax/linen industry in the United States. In this same session entitled "Bast Fiber Development in North American Universities," Dr. Nancy Kerr compared fibre properties of two common varieties of both oilseed and fibre industrial hemp. Dr. Brian Baldwin presented information concerning bast fibre crops: kenaf, sunn hemp and roselle. Peter Hopkins of Gargan Communication Group led a discussion group of about 30 attendees discussing the marketing, financing and other networking strategies are needed to commercialize agri-fibre based products. The discussion was joined by Les Edwards, CPA with Court Avenue Consulting based in Memphis, and Jeffrey W. Gain, former CEO of National Corn Growers Association. The director of the Bioenergy Initiative for the US Department of Energy, Bob Harris, moderated a panel focusing on biomass and biobased products. In particular the use of cellulose feedstocks for biofuel and energy use. Mark Downing of Oak Ridge National Laboratory discussed the "Bioenergy Feedstock Development Program" conducted at the lab. This program has screened over 125 species to select a number of model species as energy crops. One of these crops - Switchgrass, was discussed by Auburn University professor Dr. David I. Bransby. Attendees were also able to hear from Dr. Phillip Badger, the Technical Manager for the US Department of Energy's Southeastern Regional Biomass Energy Program. Other workshops focused on the use of agricultural fibres, namely cereal straws and bagasse, in the manufacture of composite construction materials. The speakers on this panel were by Don Lengel of Lengel Consulting, Brian McLeod of Panel Source International and was moderated by Bill Miller of Miller Consulting Group. Also on the topic of agricultural construction materials, Richard Cook of University of Southern Mississippi offered research conducted on the making of soybean-based adhesives for wood composites. Thursday's keynote was Dr. Ray Berard representing Interface Research Corporation and discussing the new development of flooring products from poly lactic acid (PLA), a renewable, natural resource derived from corn. The PLA products from Interface, which include carpet tiles, will account for over $100 million of Interface's sales by 2003. The automotive sector was a key discussion in the afternoon as speakers discussed the use of natural fibers in composite plastic products. The lead-off speaker was Carl Eckert of Kline & Co., Inc. which recently released a report entitled "Opportunities for Natural Fiber in Plastic Composites 2000". The report estimated growth of some natural fibre reinforced plastic products to exceed 50% over the next five years. Hugh McKee of Flaxcraft Inc. gave a presentation entitled "Supplying Bast Fibers to the Automotive Industry" and Dr. Donna Johnson of AgroPlastics Inc. discussed their proprietary wheat straw plastic technology. Dennis Lepsch, plant manager for Meridian Automotive of Canandaigua, N.Y., discussed their flax/polypropylene automotive components, as well as his general vision for the emerging industry in this sector. James Hettenhaus of cea Inc. of Charlotte, NC and Tom Schechinger of B/MAP LLC of Harlan, IA gave a presentation entitled: "Corn Stover Harvest and Collection: An Issue for Agri-pulp Commercialization". This presentation detailed methods used to reduce harvesting and handling costs for corn stover and other crop residuals. Friday included a discussion with Jeff Gain at the Agricenter International, a 1,000-acre research farm. Attendees were able to view crops and demonstrations in the field including a presentation by Bill Harris, farm manager of Agricenter International, concerning cotton production and harvesting. Other highlights included test plots of kenaf, roselle, and sunnhemp; and tours of the Stoneville Pedigreed Co. greenhouse. Over the last three years the AgFiber Technology Showcase has attracted impressive statistics in terms of attendees and quality of presentations. Since the inception of the event, over 12 Fortune 500 companies, 44 small companies, 17 universities, and 20 government or organizations have attended the event. 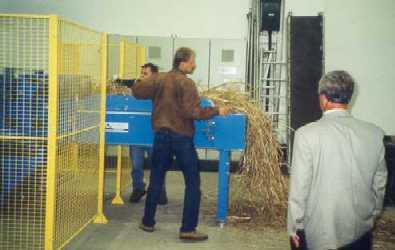 The next AgFiber Technology Showcase will take place in the fall of 2002. In 2001, AgroTech Communications, Inc. is helping to coordinate a variety of fibre-related sub-events throughout North America. These are expected to include: a kenaf field day in Memphis, Tennessee; the AgFibre Expo as part of Canada's Outdoor Farm Show; 5th Biomass Conference of the Americas; and the New Uses Council annual conference. AgroTech Communications, Inc. also has other information services including an interactive web site with updated news and events, a newsletter of fibre-based information, online proceedings from conferences, resource store, crop journal, and other tools. To go back to the Table of Contents, click here. To go to Part 1, Farming, click here. To go to Part 2, America, click here. To go to Part 3, Food & Commerce,click here. © 1999-2001 HCFR PUBLISHING. INDIVIDUAL ARTICLES REMAIN PROPERTY OF THE AUTHOR (S). NOT TO BE DUPLICATED FOR FINANCIAL OR PERSONAL GAIN. CONTACT US ABOUT REPRODUCTION RIGHTS. CLAIMS MADE BY ADVERTISERS DO NOT IMPLY ENDORSEMENT BY THE PUBLISHER.